I have been in the beauty industry for 28 years. Initially as a nail artist, I had a very successful clientele at "Steppin Out" Salon in Capitola and then at "Daryl Stevens" in Scotts Valley where I am blessed to settle in with, the now, "Rendezvous Salon" crew. In my more recent career I obtained my Esthetician license as well as a "Xtreme Lashes" LLC Advanced Certified Lash Stylist Certificate. The global leader in the lash extension industry. The majority of my service by demand is lash extensions however I provide other services as well. Born in New York and transplanted to California at a very young age when my father was transferred to Lockheed Missiles & Space/Santa Clara. I've lived most of my life in the Santa Cruz area with life experiences & College in North Carolina. I am married with two beautiful and talented daughters. I am actively involved in their schools (volunteering) and I coach multiple sports, softball and Competitive Soccer both for Scotts Valley/SLV Girls Soccer and Softball leagues. I live in Scotts Valley. I maintain an active lifestyle. Fitness & sports have been a huge part of my life and continue to be to this day. I guess you could say I'm a girly girl and a jock. Lash extensions are the perfect solution for the "on the go" woman whom does not want to fuss with flakey or running mascara or eye makeup in general. They are beautiful and long lasting. We consider them semi-permanent. Most ladies like to keep up their lashes, returning every two weeks for a "lash fill". 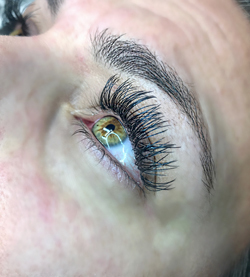 The initial service is about two hours and the fill service is anywhere from one hour to one hour and a 30 minutes, depending on natural lash shedding and aftercare maintenance by the client. 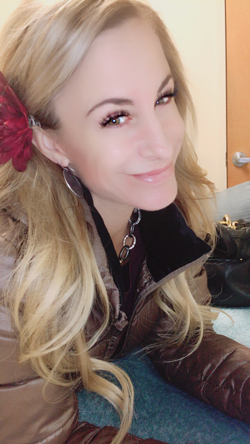 I educate each client at their initial appointment how to care for their lashes as well as sending them away with a FREE Xtreme brand lash cleanser. Be careful, they are ADDICTING! I am extremely happy with the skin care line I've chosen, "Image Skin Care". My clients have had enormous success specifically with the "Image" line, "Ipeel" chemical peels.Chemical peels are a fantastic way to renew the look and beauty of the skin. Peels return sun damaged, dull skin and fine lines back to their natural radiance by removing the top three layers of the epidermis. Peels work best when done in series of three or more but can make a difference in your skin one time. I educate the client at the time of the appointment on the importance of caring for your skin after a chemical peel. The product line is broad and there is a system for all skin types. For your convenience we retail trial kits for you to decide if you love the product and want to make the investment. Come in for a free skin analysis! I use "Berodin" wax for my waxing services. Berodin is a premium quality wax. They have two waxes for ALL waxing services. I use soft wax for larger waxing surfaces (Berodin black wax) and Berodin blue for facial waxing and bikini waxing. It's gentle on the skin, can be used at a low temperature and it removes ALL of the hair. AMAZING!